In July of last year, my family and I journeyed to the coastal resort of Susa in the northeast of Libya. As we travelled, my mother told us about Susa’ beauty, of its modern facilities, its cafés and its upmarket restaurants. However, on arrival, we were shocked at the scene that awaited us. The upmarket restaurant that my mother had spoken of had been given over to sheep pastures, while the rooms that had once teemed with holidaymakers now sat deserted and empty. Staying there proved impossible. However, when the resort manager, Jumaa Al-Khorm came to ask why we were leaving, the story of the resort began to emerge. 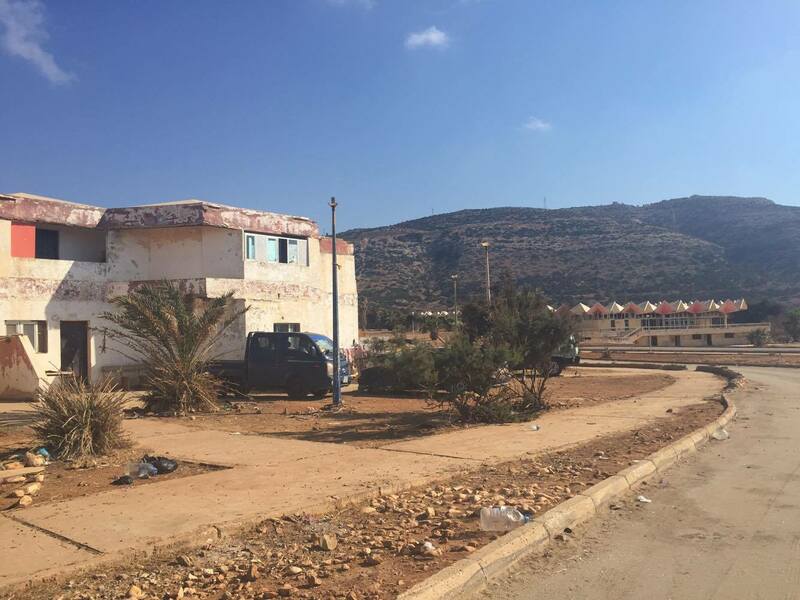 Together we learned how, in the absence of any support from the government or any of the international aid agencies, the resort had established itself as a kind of island refuge in the middle of Libya’s civil war. “The resort was originally established by the Libyan state in 1975.” Al-Khorm told us. “Following the revolution, the land was taken over by its previous owners, with this particular area being divided between my cousins and me.” Al-Khom s continued his story, describing how he had transformed the resort into a haven for the refugee families fleeing the fighting, with the entrance fee being used to maintain the resort and its facilities. Al-Khorm established a strict framework governing life at the resort. From 9 pm to 7 am the resort was closed, with no one allowed to either enter or leave, with entry at any time strictly limited to married couples and families. Disease was a continuous concern, he said, with the risk of illness spreading among the families an ever-present threat. That evening, Al-Khorm took me to meet some of the female refugees at the resort. They appeared to greet him warmly. However, during our time together, a more ambiguous picture began to emerge. The women had gathered in the room Moufida Barâassi, who had been living at the resort for the last two years. Moufida spoke enthusiastically of life there. She had been allowed to stay at the resort without paying the fee. Security, she said, came from local young men from Susa and was paid for by the entrance fees, provided her with peace of mind. Moufida spoke of how the refugees had become like a family to each other. All had mourned when one had been killed during the fighting, while all had celebrated at the wedding of one of the resort’s female residents. According to Moufida, everyone had helped in making the resort, with the expenses paid for by the entrance fee. Over time, teachers had established schools within the resort, with parties organized there at the end of each week. Somehow, within all the chaos, something like a normal life had been established. However, not everyone was so enthusiastic about life at the resort. Fatma Werfelli, along with her husband and two daughters had also lived there for two years. Relatives had told her about the resort when their landlord had evicted them. With Al-Khorm temporarily out of the room, Fatma was quick to fill me in on how she saw life at the resort. According to Fatma, Al-Khorm was unpredictable and moody and, with a permanent state of near war existing between her husband and him, life had become unbearable. Fatma and Moufida both told me of their friend, Batta, (Duck) and of how she had been evicted from the camp after her Egyptian husband had fallen ill and she was no longer able to pay the fee. As we talked a young Syrian girl wandered in, shortly followed by Al-Khorm himself. At finding me still alone with the women, he became enraged, ordering us all back to our rooms and threatening anyone who involved themselves with the girl’s family. In the end, we returned home. However, the memory of both the happiness and grief I’d found at the resort stayed with me and still I wonder about those who had taken refuge in the country’s coastal paradise. She simply took her old clothes and unstitched them, then re-sewed them. She repeated the process over and over until she was able to cut and sew.